Broadcast from your GoPro, iPhone, or DJI drone with Periscope. Now you can stream live from your drone when you take to the skies with Periscope, Twitter’s service that lets you broadcast live video, provided you have the app on iOS and a DJI drone. In addition to live drone streaming, Periscope is also rolling out a new search function that will let you look for specific live streams and saved broadcasts. You’ll be able to search for topics or hashtags with the new system. A save function, currently in beta, is also expected to arrive in a few weeks. The save feature will let you save your streams indefinitely, and they’ll show up in Periscope and Twitter in perpetuity. If you change your mind and don’t want a specific broadcast archived, simply delete it in your profile or the post-broadcast stream. You’ll be able to opt out of this default behavior and let your broadcasts go away after 24 hours with a quick trip to the settings. Searching is also a new way to interact with your periscope stream. 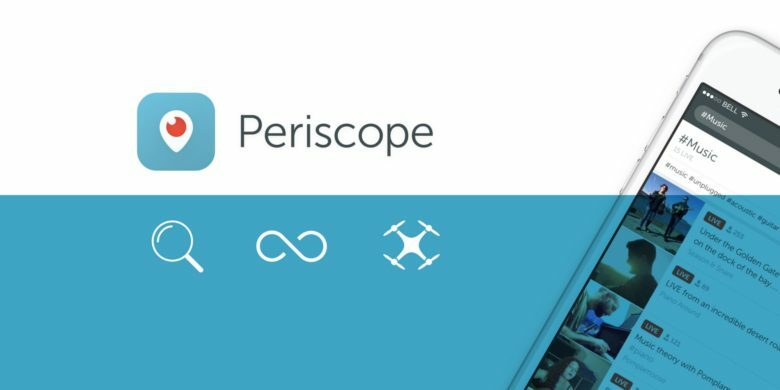 Periscope has added two new search terms, too, “GoPros and Drones” — for the action cameras — and “First Scope,” a feed of new broadcasters. For drone streaming, you’ll need a “supported DJI drone” (DJI Inspire, Phantom 4, Phantom 3 Professional, Phantom 3 Advanced and Osmo) and to use the currently iOS-only live streaming feature, and you’ll be able to switch between your drone, your iPhone camera, and a GoPro all during the same broadcast. You’ll be able to narrate the broadcast from your iPhone, and even Sketch right on the broadcast itself to annotate your flight. Now Periscope users have a few more ways to find and allow others to find their own video broadcasts, from smartphone to GoPro to live drone streaming.